Born in Henderson, Rusk County Texas, Dr. Brian K. Nichols has called Mt. Pleasant home since 2001. Dr. Nichols is married to Kerri, and they have two children, Luke and Bethani. In his spare time, Dr. Nichols enjoys spending time with his family, including supporting his children’s interest in extra-curricular activities. Also, he enjoys hunting and fishing. Dr. Nichols and his wife, Kerri, have truly made Mt. Pleasant their home and are involved in the community. Both are active members of the Tennison Memorial United Methodist Church in Mt. Pleasant. Both serve on various committees and boards in their church and serve as Sunday School and Bible study teachers. Dr. Nichols is a member of the Mt. Pleasant Lions Club where he has served on the Board of Directors. Dr. Nichols also serves on the Board of Directors of Titus County Cares. His wife, Kerri, is a member of Junior Auxiliary of Mt. Pleasant and serves on the Titus County Child Welfare Board. Dr. Nichols set optometry as his career goal and focused his undergraduate education at Stephen F. Austin on this path. Ultimately, he was accepted to the University of Houston, College of Optometry. 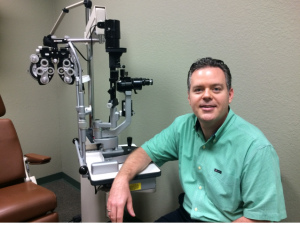 After completing a rigorous education and training program at the University of Houston, which included clinical rotations at the Santa Fe, NM Indian Health Service Hospital and the Little Rock, AR Air Force Base Hospital, Dr. Nichols completed his Doctor of Optometry degree in 1997. Later that year, following graduation from optometry school and completion of the national and state board examinations, Dr. Nichols became an associate of Dr. J.T. Roberts in Kilgore, Texas. Over an 11-year period, Dr. Nichols practiced as an associate of Dr. Roberts in offices located in Kilgore, Gilmer and Mt. Pleasant. Dr. Nichols’ dream, from the beginning of his career, was to own an independent practice that he could call his own. This goal was eventually achieved when Dr. Nichols purchased the Mt. Pleasant practice in 2008.